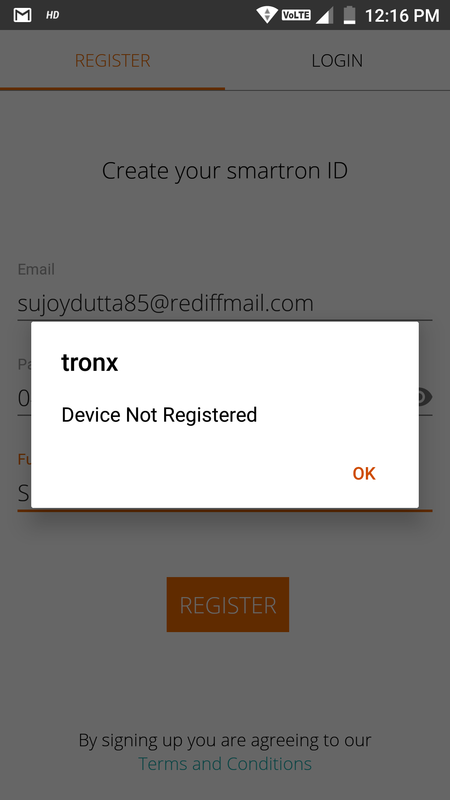 @Abhishek_TV I am unable to register tronX account on my SRT phone. Please help. @Abhishek_TV Even after reset i tried multiple times.What should i do now? This is a new phone which got delivered today. the boot screen shows some kind of weird message before the actual smartron logo plays out. I checked in many youtube videos and this is not how the actual consumer end device starts. It also has preinstalled packages like Carrier Config, Qualcomm settings, CSK, hid, OMACPDemo, OmaDrmEngineDemo, QSensorTest, Security, SnapdragonSDKTest which should not be present in a newly bought device. The kernal version shows 3.10.84 jenkins@IOTtestPC #1. Whatsapp shows a message which reads "You are using a custom ROM, Whatsapp will not be liable for any security or privacy issue. I don't think i will be able to register tronX in this device. Please reply. Oh ho! That doesn't sound good. From which website did you buy it? You may please raise a return/replacement request immediately. @Abhishek_TV @Sahul @RohitRathi @HSR From Flipkart. I raised the return/replacement request and they said they will send a technician first to look at the matter. Kindly please check your manufacturers/suppliers since such device raises privacy and security concerns for your customers. These devices should not be there for sale in the market. Many citizens in our country are not savvy enough to know the difference. Ultimately it affects both Smartron brand name and consumers. I hope this kind of mistake is not widespread cause this will push future consumers away from your quality products. Hope you understand what i am saying. Please also do an audit if possible, to check the proliferation of such devices. I clearly understand it and apologize for this issue. It might be a very rare case, however, we will definitely look into this matter. Hi.. @Abhishek_TV , @Sahul @RohitRathi @HSR I had bought this mobile for my mom(from Flipkart), who is not tech savy. recently she brought the phone to me with certain problems. Then i noticed that it has all the problems like mentioned here. @sasimgo Can you send a mail to tcare@smartron.com and cvttest3@gmail.com with the screenshots of the same? We will look into it. If your 10 day Flipkart replacement period is over then you should take the phone to Smartron customer care to flash the OS. That will solve the issue. Thankfully I replaced my device within 10 days Flipkart replacement period though it took them 21 days, multiple phone calls, emails and 3 service engineer visit to properly understand my issue. I hope you will not face such issue.